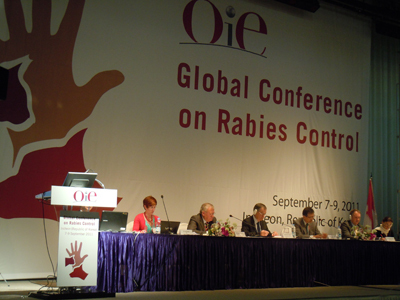 The global conference on rabies control was held on 7-9 September in Seoul (South Korea). The conference was organised by the World Organisation for Animal Health (OIE) in collaboration with the FAO, WHO and European Union to focus attention on the most critical points in the management of rabies, which is still endemic in 110 countries and is strongly conditioned by the different ecological contexts in which it arises. Despite its important socioeconomic and health implications, the disease is still often underestimated. There is a persistent paucity of data and lack of adequate surveillance systems for recognition and monitoring of the epidemiological situation in animal populations, essential for the prevention and effective control of rabies. This is despite the existence of sufficient technological instruments and scientific knowledge to eradicate this disease, which still kills at least 55,000 victims every year, most of them children, and is widespread in many parts of the world. The thematic sessions stimulated open discussion between the OIE delegates, representatives of national and local competent authorities, non-governmental humanitarian, environmental and animal welfare organisations, researchers and legislators. The debate included the analysis and promotion of strategies to combat inefficiencies arising from the lack of coordination of the various control plans, which are often implemented at a local level only and are weakened by a progressive lack of resources, generally used to tackle other public health problems considered more urgent by central governments. Full consensus on the urgent need to concentrate coordinated, systematic efforts on sustainable long-term strategies that respect the balance of the ecosystems concerned. Importance of improving the quality of diagnostic tools and promoting and sustaining the research and development of new immunisation devices, including through oral administration and use alongside pharmacological products for the mass sterilisation and vaccination of canine populations, which are responsible for 95% of cases of transmission to humans. Condemnation of indiscriminate and often inhumane culling of stray dogs, often used in developing countries as the sole measure for rabies control even though universally recognised as ineffective, uneconomic and ethically unacceptable. Reminder of the OIE's contribution to the fight against rabies through an international network of reference laboratories and centres of collaboration, professional training and refresher courses, and potentiation of the diagnostic capacity of official veterinary services. Full consensus on the importance of communication as a central element for the active involvement of the communities most at risk, alongside a system of regulations aiming to promote responsible ownership as the key to enduring results for animal and human health. Socioeconomic impact of rabies and cost-benefit analysis of the various possible prevention and control measures: just 10% of the funds used worldwide for post-exposure rabies treatment would suffice to finance canine rabies eradication plans, thus preventing almost all cases of human infection. Presentation and discussion of the international standards and tools made available by the OIE to support and improve veterinary public health in developing countries, stressing the central role and responsibility of national veterinary services in achieving the full integration of public and private veterinary services for the prevention and control of zoonoses. Prof. Caporale coordinated the work session dedicated to integrated rabies control plans, based on an intersectoral, multidisciplinary approach to rationalise available resources and promote effective, efficient and economically and ethically sustainable action plans. Experts from the OIE collaboration centre for veterinary training, epidemiology, food safety and animal welfare presented the Istituto G. Caporale's efforts in developing a new canine parenteral vaccine, information systems for the management of canine and feline populations, and novel information and educational tools, including the CAROdog [dear dog] website dedicated to responsible pet ownership. Finally, a document was drawn up containing the recommendations deriving from the work sessions. The official text will soon be available on the OIE's website, along with other important initiatives including the immediate launch of a pilot project to create an international bank of rabies vaccines in order to ensure the constant availability of immunising doses, for use above all in emergencies.